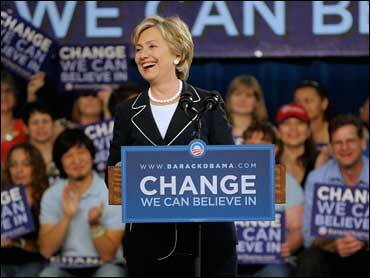 Hillary Rodham Clinton's top campaign strategist advised her to cast presidential rival Barack Obama as having questionable "roots to basic American values and culture" and use the theme to counter the image that his background is diverse and multicultural. "I cannot imagine America electing a president during a time of war who is not at his center fundamentally American in his thinking and in his values," Mark Penn wrote in a March 2007 memo to Clinton. Clinton did not take Penn's advice, revealed by a report in the September issue of The Atlantic magazine. The article says Clinton's campaign for the Democratic presidential nomination went from front-runner status to failure for a number of reasons, from badly managed money to blistering warfare between advisers. Clinton, the candidate who said she was ready to lead on Day One of her administration, did little to quell the infighting. Clinton grew angry during a conference call with her senior aides about how to recover from her loss in the Iowa caucuses. She found herself doing most of the post-mortem, to near-silence on the other end of the line. "This has been a very instructive call, talking to myself," Clinton snapped, and hung up, the magazine reported. Mostly, the disputes were over whether to go negative against Obama, a half-black, Harvard-trained lawyer with a gift for soaring rhetoric and big themes. Obama's background - he grew up in Indonesia and Hawaii - was a "lack of American roots," Penn wrote. Also a weakness, he added, was the divisive rhetoric of Obama's controversial pastor, the Rev. Jeremiah Wright, who cursed America during a sermon. "Won't a single tape of Wright going off on America with Obama sitting there be a game-ender?" Penn wrote in a March 30 memo. Penn's memos also contained prescient advice. The memo from March 2007 talked about the importance of a key voting bloc he called "the invisible Americans" - women and lower- and middle-class voters. Those groups helped Clinton beat Obama in key states before she quit the race in June.